The striped bass also known as a striper is an anadramous fish that is prized by many anglers due to their strong fighting abilities, size, and taste. The possibility of catching a 30-pound striped bass keeps anglers fishing on their toes in hopes of landing a fish of a lifetime. Native to the Eastern United States, the striped bass was introduced to California in 1879 as a commercial food source until 1935. Commercial fishing for striped bass ended at this time in efforts to enhance California's sport fishery. The striped bass is unique in they can be productively sought after in both salt and fresh water. 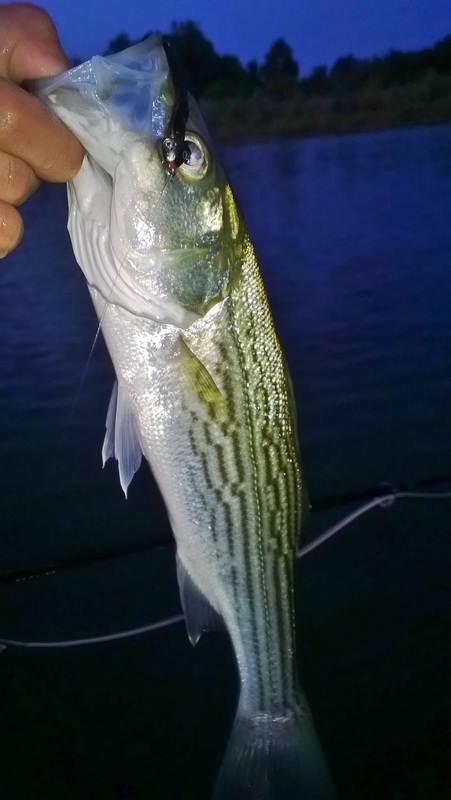 Although most commonly fished for when they migrate back to freshwater rivers to spawn, striper fishing can be done in estuaries, surfs, and oceans. The living conditions of striped bass provide anglers opportunities to catch them all year around. A truly adaptable predator, the striped bass is one of the top aquatic predators where ever they are found in California. Eating both non-native and native fish, the striped bass is voracious in both fresh and salt water unlike anadramous salmon that stop eating once they leave the ocean. 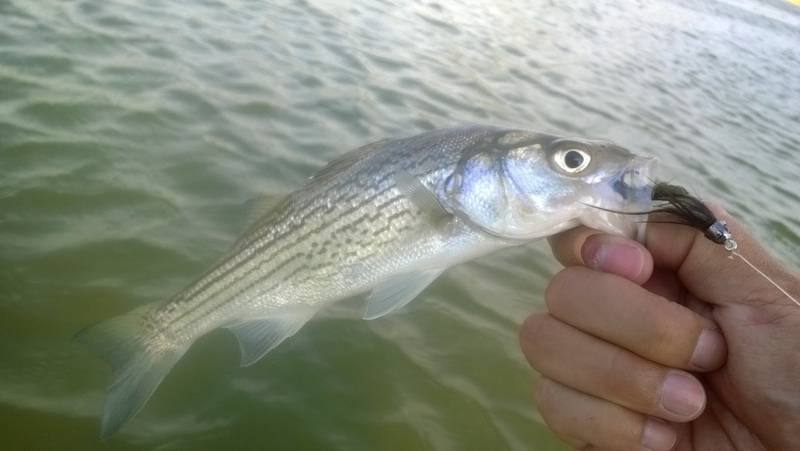 Striped bass will eat flies, lures, and bait making them easy targets once found. My fishing experience for striped bass is pretty limited. Information on successfully fly fishing for this species was also limited for some odd reason. 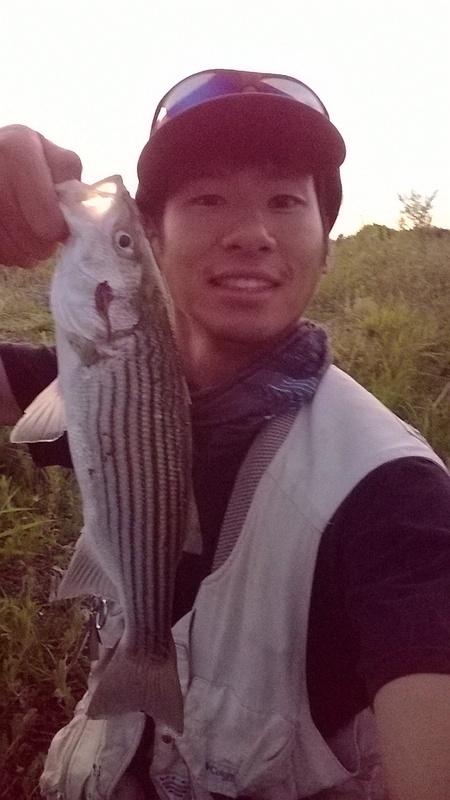 From what I could find online, it seems like striped bass fish like black bass. Striped bass like to hold and feed around structure such as rock piles, trees, boulders, etc the same as black bass but add river current as a factor in finding the most ideal holding spots. Riffles and runs are for trout, low moving currents are for stripers. Striped bass like to hang out in schools so if you find one your bound to find another. Good flies to use are the classic saltwater patterns like the clouser and deceiver. A boat is the most ideal way to chase striped bass. Not having a boat has always limited my striper fly fishing accessibility, therefore I focus more on fly fishing for trout and steelhead which hold in areas that are more bank angler friendly. This year I've found that it's not impossible to find and catch striped bass along the banks of the river. 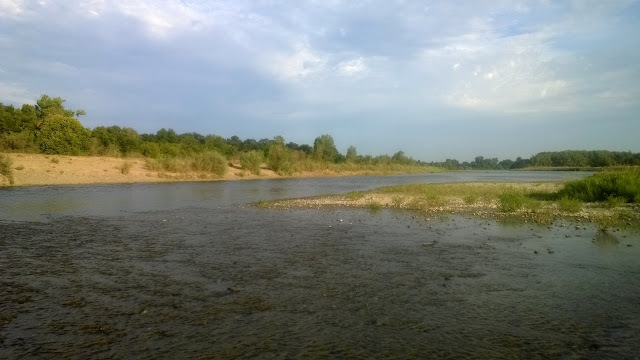 Although it can be difficult depending on the timing and where the fish are, fly fishing for stripers on our very limited riverbank space is doable. This river is the super highway that the striped bass own when they make their way up from the ocean. From what I've research, most of the best striper fishing is done around the Colusa area downstream. Although there are local stripers that never leave the river system, the bulk of the migratory fish arrive in spring to spawn and hang out eating shad until summer. 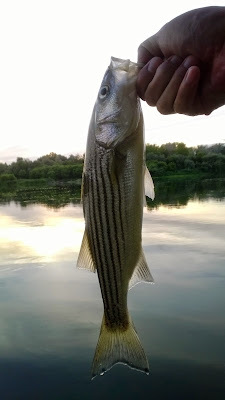 Yesterday I went out on a gamble to see if I could find any striped bass outside of Chico. To make the gamble a bit more enjoyable, I used my switch rod to get some spey casting practice in. The flies I used were bait fish patterns and a sculpin pattern that the fish seem to love to hate. Luckily the river wasn't too crowded and I was able to fish the current where I had caught a few stripers before during the shad run. Over an hour and a half of covering as much water as I could upstream and downstream, casting close and far, and stripping fast and slow yielded one little striped bass that threw the hook after I landed it. I guess I'm doing something right? The next area I fished was very riffly more ideal for trout. Sorry the stripers are in a different part of the river. After covering this piece of water as quickly as I could, I fished the opposite side where the river formed more of a bay. Striper Bay. An erratically fast retrieve with a sculpin pattern finally hooked something and it feels big. The fish jumped into the air and I couldn't tell if I saw a brown or white hue. Crap. Please don't be a pike-minnow! Once I got the fish close enough I saw that it was a fattie smallmouth. 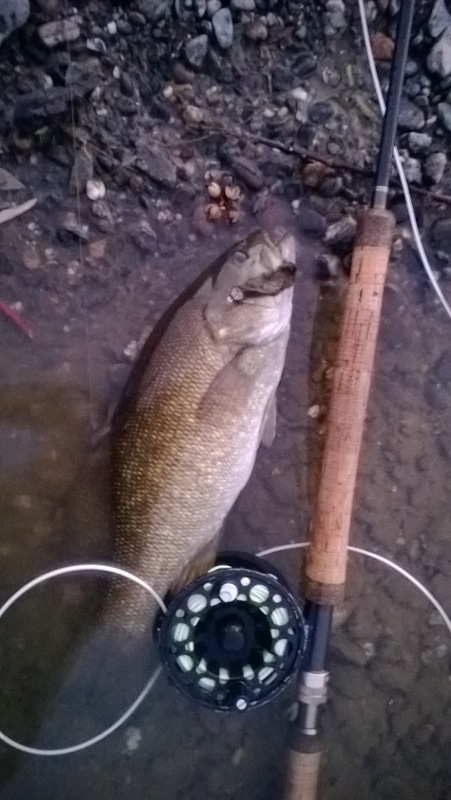 This is the biggest smallmouth I've caught so far; 16'' and probably around 2-3 pounds. The sun was set and I was starting to lose light but I finally found the fish. My next few casts I performed the same retrieve and found what I was looking for, a striped bass. Though not a very big one, it felt pretty good on my switch rod pulling some line during its runs. The night ended with 3 striped bass hooked and landed with a bonus smallmouth. Not bad for a striper noob. The following evening I went at again. The excitement of finding and catching a few local striped bass was far too good to just let up. Now that I know where they were it was game time. I woke up at 6am in the morning to the bright beating sun in hopes of catching a few morning stripers. It turns out that they don't like to play during the day, at least where I found them yesterday. After fishing for over 4 hours covering every single stretch of water I could get to, I couldn't find them. It must be an evening thing. After a full day, I left the apartment and was on the river at 7pm. This time I brought my 6WT to up the fighting fun. The river was void of other anglers leaving me with Striper Bay all to myself. After throwing a few casts, wham! my first striped bass of the day. The next few fish I landed where dinks and by the time I landed my third fish the sun was set. It was time to start heading home so I started to wade back to my car covering water as I went. Nothing was biting. Well so much for catching a decent-size fish tonight. But then to my surprise it happened!